When the Ravens play at 4pm, we tend to eat dinner in front of the television. Most of the time, I'll make something that doesn't involve utensils, but this particular Sunday, I had lots to do between waking up and settling down on the sofa, so I decided to whip up some chili. 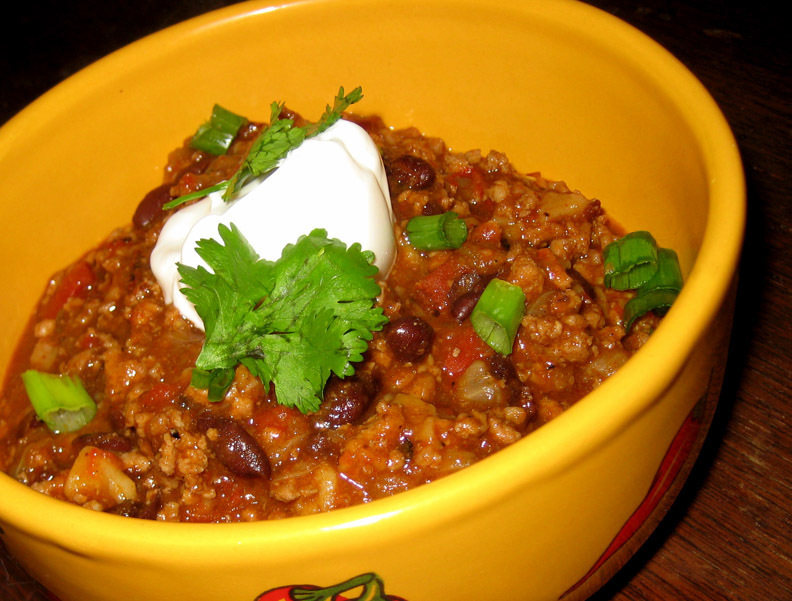 Chili is great because there's relatively little prep and plenty of unsupervised cooking time. Just chop up an onion, open some cans, and go do other stuff while the meal basically makes itself. I had some odds and ends that I wanted to use up, so they went into the chili. Also, straight-up ground beef seemed really expensive last week for some reason, so I bought whatever other ground meat I could find that was less-expensive. All-turkey is kinda boring, so a package of mixed meats went in with it. Honestly, we couldn't tell that it wasn't beef chili, what with all of the other flavors going on. sour cream, cilantro, chopped scallions, shredded cheddar cheese for garnish. Mix first four ingredients in a small bowl. Set aside. In a dutch oven, heat a bit of olive oil and add onions. Cover pan and sweat onions until translucent. Add ground meats. Cook until meats are no longer pink, breaking clumps with a wooden spoon. Stir in garlic and half of spice mixture. Add salsa, chiles, red pepper, tomatoes, beans, chicken stock, jalapeno, and chipotles. Bring mixture to a boil, then turn down to a simmer. Cover and cook on low heat for 2 hours, stirring every once in a while. After two hours, if there seems to be too much liquid, remove lid and turn up heat to evaporate some of it. When consistency is more to your liking, check for seasoning and add the remaining spices and the cocoa powder. If you think it needs a bit of sweetness, add the honey. Allow to cook for another 30 minutes or so, then add salt and pepper to taste. 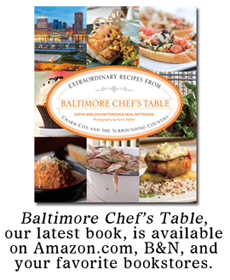 Remove from heat and serve in bowls with garnishes and corn bread or muffins. Preheat oven to 450 degrees. Lightly grease muffin tins or corn stick pans with a bit of butter or oil. Place pan in oven to heat. In a mixing bowl, combine the corn meal, baking powder and salt. Stir in the milk, eggs, creamed corn, and oil, mixing together until the batter is smooth. Stir in frozen corn and scallions. Pour batter evenly into preheated muffin tins or corn stick pan. Bake 20-25 minutes. Cool on a wire rack. 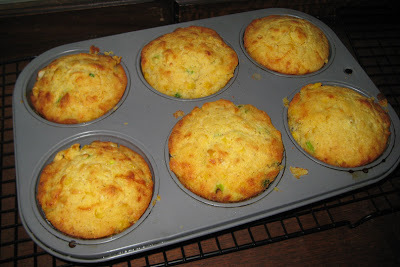 Makes 12 regular or 6 jumbo corn muffins.